A complete team approach for all your chiropractic and sportsmedicine needs. The Graston Technique® is a unique approach to soft tissue problems. This remarkable procedure allows us to detect and treat areas of “scar tissue” or adhesions in muscles, tendons and ligaments that can lead to pain and dysfunction. In the healing process our body attempts to repair muscles, tendons and ligaments with “scar tissue”, much like the scar that forms on the skin when you have scraped or banged your knee. As you can imagine, that scar tissue is not as strong and flexible as normal, healthy, undamaged tissue. Over time we can have a build up of this fibrous scar tissue, particularly in the muscles, tendons and ligaments that get a lot of use. This can lead to pain and dysfunction because this replacement tissue lacks the strength and flexibility of healthy tissue (in some areas it may even mat down and entrap a nerve). The Graston Technique allows us to better detect and treat these areas because it uses a stainless steel instrument that glides along a patient’s muscle, tendons or ligaments and acts like a “scar tissue” stethoscope. When knots or bands of scar tissue are encountered, both the doctor and the patient sense a restriction or a granular feeling. The instrument can then be used to “break up” this restriction or adhesion. Stretching exercises are then used to promote re-alignment of the fibers so that they behave more like normal, healthy tissue. The benefit of the Graston Technique is not only in detection of restrictions or adhesions, but also in the amount of improvement that takes place in a short amount of time. Unfortunately, the unaided hand is hard pressed to detect and break up as much scar tissue as the stainless steel instruments can. When the Graston Technique is coupled with the necessary strengthening and stretching exercises, it provides a great aid to the chiropractic adjustment and the patient gets better much quicker and more completely. Graston Technique treatment protocols may also include the use of heat, ice and rehabilitation to restore patients to their pre-injury level of activity. Muscle re-education, in addition to stretchng and strengthening exercises are employed to provide the patient with optimal results within a minimal number of treatments. Following and staying with the plan of treatment is critical to achieving the clinical goals set by the clinician and the patient. Without full commitment to treatment, a positive outcome may not occur. Most patients report pain reduction and improved function within the first two treatments. Although it is not unusual to experience some discomfort during initial treatment, it should dramatically lessen within a short period of time. Mild to moderate bruising may take place during the process of breaking down old scar tissue. During the course of treatment, daily consumption of 6-8 glasses of water, along with a diet rich in fresh fruit and vegetables will also prove beneficial. Factors such as age, history of the condition, occupation and lifestyle will determine the number of times that you will be treated. The average number of treatments is 6 to 8. Generally treatment is performed no more than twice a week unless the clinical circumstances dictate otherwise. The Graston Technique is not appropriate for every patient condition. It is, however, very helpful for people with the most common conditions we treat in this office. If you have not experienced the Graston Technique and you still have lingering discomfort or stiffness, please ask us whether you may be helped by this effective new treatment. The Graston Technique® is a soft-tissue diagnostic and therapeutic method that has been used in outpatient clinics since 1993. A key protocol of the Graston Technique, Graston Instrument-assisted Soft Tissue Mobilization (GISTM) has only recently been introduced to the chiropractic profession. 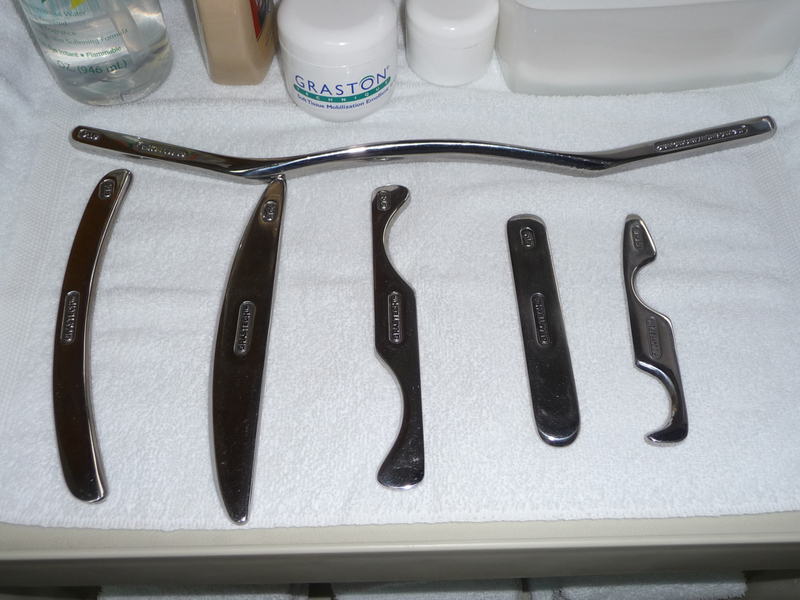 Graston instruments – made of stainless steel, specifically designed and developed as an alternative to transverse friction massage – are used as an aid in the diagnosis and treatment of soft tissue dysfunction or pathology. The instruments provide tactile diagnostic feedback to both the doctor and the patient, as the instruments act as a focused extension of the doctor’s own hands. Clinical trials of the effectiveness of Graston Technique in the treatment of carpal tunnel syndrome, lateral epicondylitis and post-surgical low back pain are underway or have been funded. 1. Gehlsen GM, Ganion LR, Helfst R. Fibroblast responses to variation in soft tissue mobilization pressure. Med Sci Sports Exerc 1999;31(4):531-5. 2. Davidson C, Ganion L, Gehlsen G, Verhoestra B, Roepke J, Sevier T. Rat tendon morphologic and functional changes resulting from soft tissue mobilization. Medicine and Science in Sports and Exercise 1997;29(3):313-9. 3. Earley BL, Carey MT, Hall A. The Graston Technique of Instrument-assisted Soft Tissue Mobilization. In: AOTA Annual Conference and Exposition; 2000 March 30 – April 2; Seattle, WA; 2000. 4. Sevier TL, Wilson JK. Treating lateral epicondylitis. Sports Med 1999;28(5):375-80. 5. Carey MT, Ploski M, Sweney L. The Graston Technique of Soft Tissue Mobilization. In: APTA Combined Sections Meeting; 1999 February 3-7; Seattle, WA; 1999. 6. Melham TJ, Sevier TL, Malnofski MJ, Wilson JK, Helfst RH, Jr. Chronic ankle pain and fibrosis successfully treated with a new noninvasive augmented soft tissue mobilization technique (ASTM): a case report. Med Sci Sports Exerc 1998;30(6):801-4. 7. Perle SM, Perry DG, Carey MT. Effects of Graston Technique on Soft Tissue Conditions: A Prospective Case Series. In: WFC’s 7th Biennial Congress; 2003; Orlando, FL: World Federation of Chiropractic; 2003.